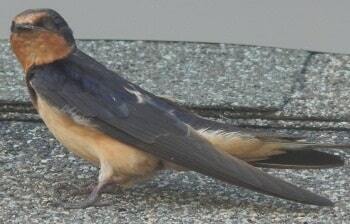 The Barn Swallow with its distinctive long forked tail, makes it one of the easier North American swallows to identify. When flying, the feathers are swept back and form a single long point behind the bird. One sure sign of summer is when you see them flying back and forth to an open barn or outbuilding where they build their nest. This bird spends more time in the air then almost any other land bird. 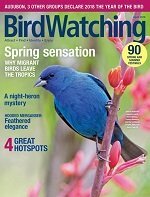 A friend to farmers, these birds are on an endless search for insects throughout the season. Measuring 5 1/2 to 7 inches in length with pointed wings and a deeply forked tail. The bill is very short. Dark blue-black above with a dark rusty throat. The rest of the underparts are a buffy or pale rusty. These birds are generally monogamous, males mating with a single female. Although rare, males sometimes will pair with 2 females. Paired males will aggressively defend the small area around the nest and guard his mate from other males that might attempt to copulate with her. Both the male and female build the nest, usually in the morning and making up to 1,000 trips to collect mud. 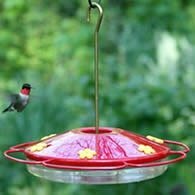 Although these birds probably nested in caves and on cliffs, they now use man-made structures such as barns and the overhangs of decks and patios. The nest is a cup of mud pellets lined with grass and feathers, built under eaves of buildings, resting on a beam or some projection in barns, under bridges, in culverts, or occasionally in a niche on a cliff. The female lays 3 to 8 white eggs that are spotted with reddish brown. 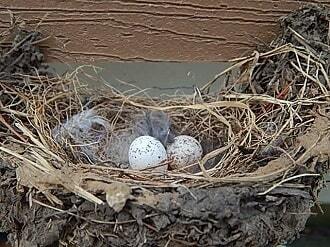 The eggs are incubated for 14 to 16 days and the young will leave the nest in 18 to 23 days. Two broods a season may be attempted. Barn Swallows return to the same nest season to season repairs to that nest if needed. Removing nest during the winter will not keep them from returning. A barrier may have to be built in order for them to change sites. Once they move on, the barrier can be removed. 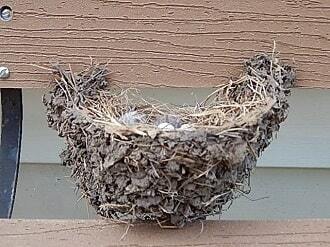 If you do not want them nesting (they can be messy) on your home, you must not let them build their nest. You can remove their nest until eggs are laid. Once eggs are laid, the law protects them making it illegal to interfere during the nesting cycle. These birds eat and feed their young flying insects caught on the wing. During the breeding season these birds will feed in pairs and fly at a low altitude, generally over fields and water. Sometimes these birds are mistaken for Purple Martins. You are most likely to see these birds following you as you mow large field areas. Swooping close to the ground and catching insects the lawnmower or tractor causes to fly up. Purple Martins do not feed that close to the ground. Instead, you'll find Martins feeding very high in the air to feed. 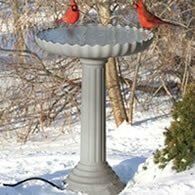 They will fly low over water to drink. 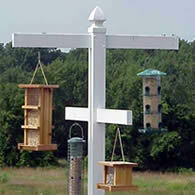 Over water is where you may see both Purple Martins and Barn Swallows together. During the non-breeding season they will feed in small, loosely formed flocks. The habitat of Barn Swallows is mostly open country and marshes, especially near barns, outbuildings, bridges, and culverts. 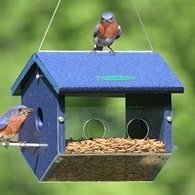 Since humans are developing more housing in what was once farm land, these birds can be found more and more nesting on houses around people.